About a week before our journey to Southeast Asia began, Jess overheard another nanny talking about how she was moving to Hanoi in a few days while waiting for school pickup. Jess couldn’t help but introduce herself to ask for some tips about the city. They ended up exchanging emails and after a few quick messages back and forth, planned to meet in Hanoi. 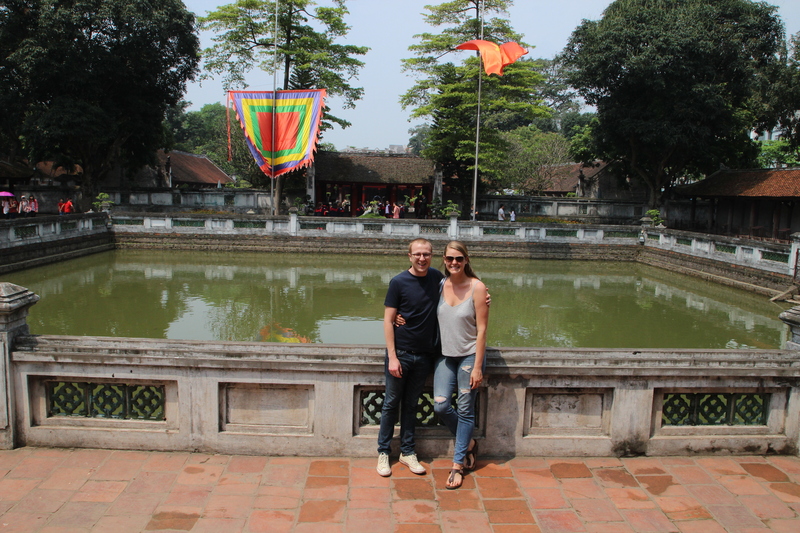 As a pleasant surprise, Morgan and her husband Nick offered to show us around for the day, as it had been almost eight years since they first met while studying abroad in Vietnam and wanted to do some touristy things as well. We began our day meeting our new friends at Cafe Phố Cũ, a well hidden gem of a coffee shop located behind two souveneer shops. Had we not met Morgan and Nick out front, we never would have found the place! After a brief conversation on the sidewalk, Morgan drove her motor bike straight through the souveneer shop, down an alley in the back of the store and into the open air entrance of the coffee shop. 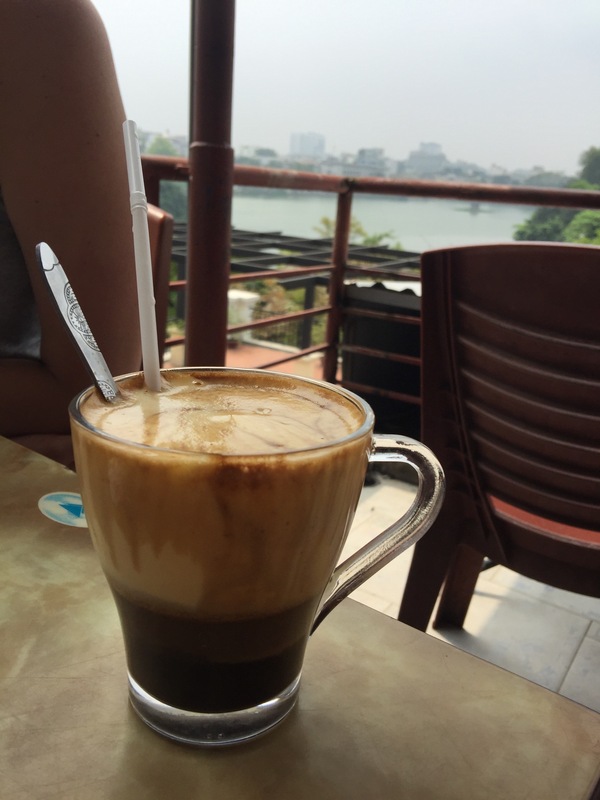 After placing our orders, we walked up three different styled flights of stairs and enjoyed our cà phê trứng, iced Vietnamese egg coffee, on the rooftop overlooking Hoàn Kiếm Lake. After finishing our coffee, we headed to the Hanoi Hilton. 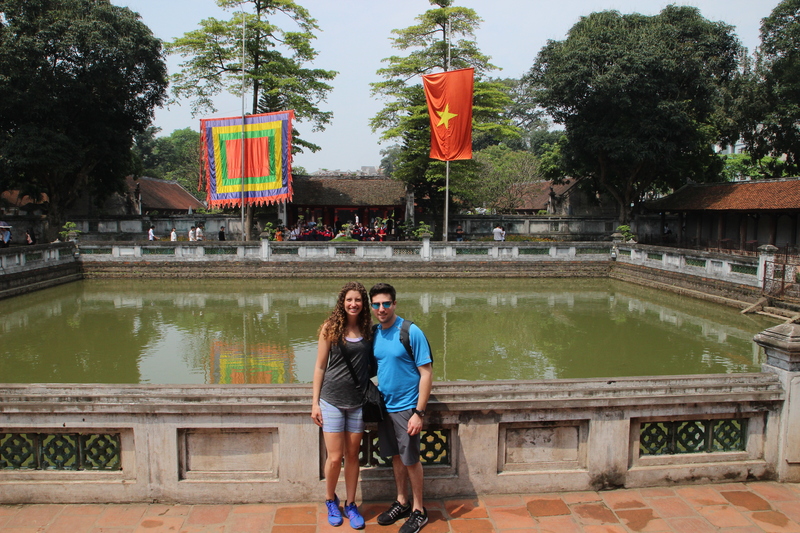 Built by the French during their colonial rule of Vietnam in the late 1800s, this was no luxury resort! Also known by its French name Maison Centrale, Hỏa Lò Prison is famous for housing hundred of American Prisoners of War. Many of the American POWs were brough to Hỏa Lò Prison for interrogation and torture. This was where John McCain spent five years as a prisoner of war after being shot down over northern Vietnam. While only a portion of the prison remains, after the government decided the prime real estate could be put to better use, you can truly get a sense of the conditions prisoners faced during their sentence at Hoa Lo Prison. Prisoners who were sentenced to death had no access to outside light, were shackled to the ground on an incline that seemed to make it difficult to sit up and uncomfortable to lay down. Entrance to the museum was definitely worth the 20,000 VND per person (90 cents). 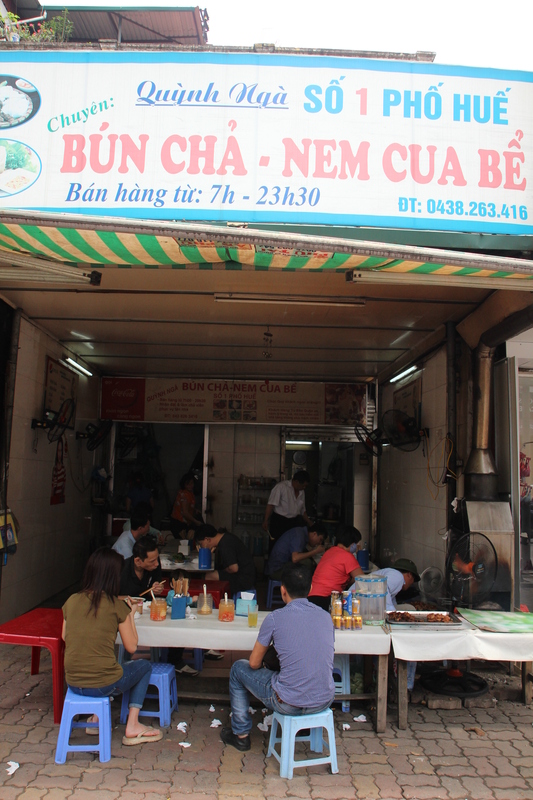 After the Hanoi Hilton, we went over to to a little street food place where they serve bun cha and crab spring rolls (nem cua be), two dishes that are native to the north of Vietnam. We ordered two servings of the soup, one for each couple to share. The soup is a cold broth with bbq pork served with fresh herbs and a side of cold noodles. You can add any of the herbs to the soup including cilantro, mint, and mint leaf as well as the bird peppers that are abundant in vietnam. When you are all done fixing up your soup, you dip your noodles into it and enjoy the combination of flavors. It was a perfect meal on the fairly warm day we were having and everything was so good! The pork was incredibly tender and flavorful and the soup was very refreshing, especially since it was cold. We also shared one order of the crab spring rolls, which were super crispy and packed with fresh crab meat as well as some spices and herbs. This lunch was the perfect amount of food and super cheap (about $12). Next we went to Văn Miếu, The Temple of Literature, which is a Temple of Confucius located in Hanoi. The temple, dedicated to the memory of Confucius, was established in 1070, and was home to Vietnam’s first national university. The walk through the temple grounds was beautiful, consisting of a series of five courtyards, separated by gates, and is a must see if you appreciate ancient Asian architecture. Each gate and courtyard has a special significance in regards to education and talent. 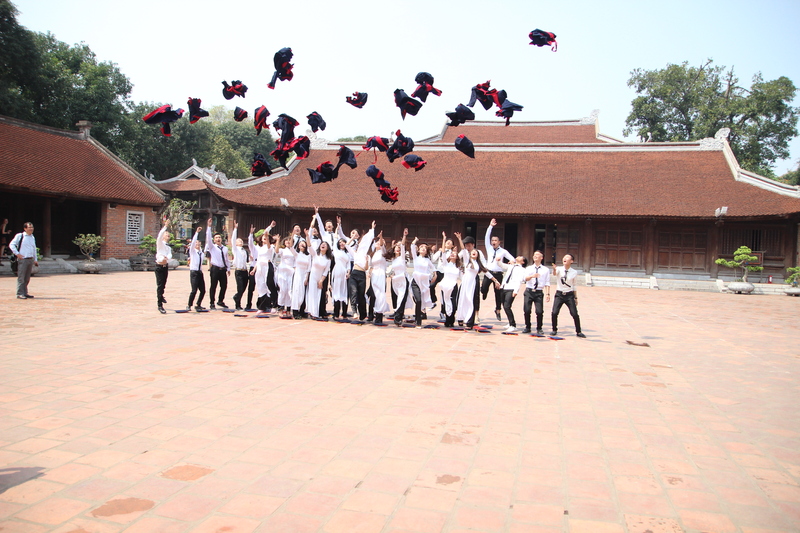 It seemed as though today many Vietnamese teens were celebrating their graduation from high school, and came to the Temple of Literature to celebrate and take pictures. After leaving the Temple of Literature we headed to the Vietnam Military History Museum. 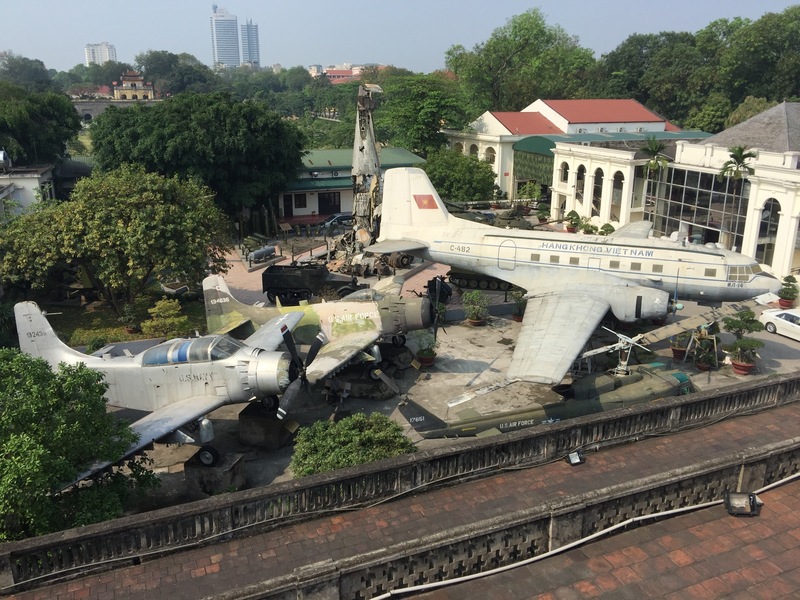 Inside the museum grounds are a multitude of Vietnamese and captured American and French military equipment including helicopters, planes, tanks, and other large artillery. In addition, the Flag Tower of Hanoi is located here, which is part of the Hanoi Citadel, a UNESCO World Heritage Site. After the Vietnam Military History Museum we headed for Bia Hoi. Bia Hoi, an inexpensive local beer, is brewed and delivered daily. With an alcohol content of only about three percent, and a price around 4000 vnd (18 cents USD), you can enjoy several of these refreshing brews without breaking the bank! We enjoyed our Bia Hoi with boiled peanuts and Rau Muong. 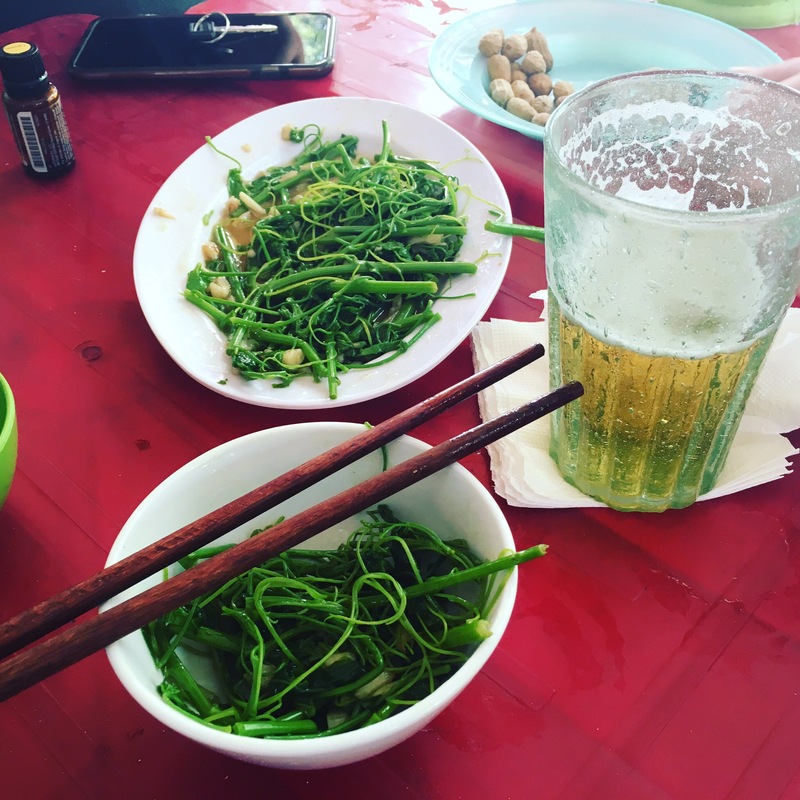 Rau Muong, also known as morning glory or water spinach, is one of the most popular vegetables in Vietnam and is typically served sautéed with garlic. It made for a delicious mid-afternoon snack! At the recommendation of Morgan and Nick’s friend Nam, the four of us ventured to Lệ Mật. Colloquially known as Snake Village, it is located northeast of central Hanoi. 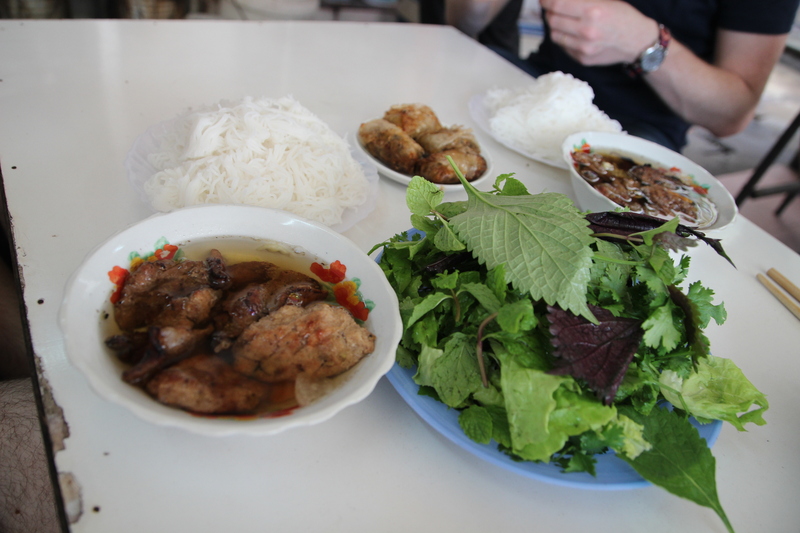 On a mission to find something interesting to eat, we found ourselves at sitting at Quoc Phuong Trai. As the only non-Vietnamese patrons, we knew we were in for a treat. 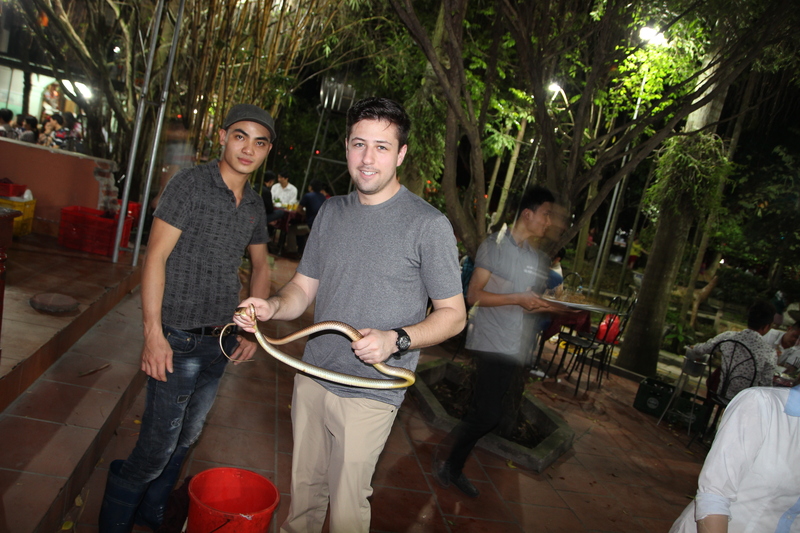 We had intended to order the King Cobra, which came with 11 dishes including shots of cobra blood and vodka, and the chance to eat a beating cobra heart, but due to some language difficulties we ended up ordering grilled Bamboo snake. The snake was well seasoned and grilled to perfection. We also ordered a roasted chicken. The chicken was moist, incredibly tender, and topped with crispy golden skin! We also had Rau Muong. Even though we missed out on eating beating cobra hearts we still had a great meal with great new friends. Even if you aren’t feeling brave enough to eat snake, there are many other less exotic options on the menu and we highly recommend the roasted chicken. 1) When you need to cross the street, just walk, don’t stop, stay at the same pace, and try to just make eye contact with the motorbike drivers. Remember: the cars and busses will NOT stop for you, but the motorbikes will go around you very easily…trust the system!! 3) Check for bed bugs in EVERY hotel…they do not discriminate and can still be found in the 5 star hotels!! 4) Don’t drink the tap water or shower water!!! In restaurants and some hotels, generally they will either have or give you bottled water. Some of the newer hotels have begun to instal purification systems, but we have yet to see any. Looking forward to heading to Hoi An and Da Nang for the next few days.